That is neatly done , exposing the kernel to smoothed audio input works nicely; the sky float is definitely worthy of close examination. Cool...and yep, the depth equation at the beginning can have lines commented out/in to tweak the objects that are appearing in the scene. This shows how to use core image's available ternary operation instead of if/else, which isn't allowed core image kernel language. 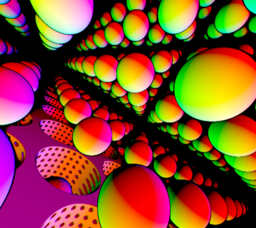 Not anything that challenging, but it shows how to retrofit a decent amount of glsl code. I've done this more for the sake of curiosity and comparison. I don't think it seems to perform as well as glsl, even though it's supposed to deliver optimized code during compilation by not allowing if/then/else.